Spiders seem to tap into a primeval fear inside humans. Perhaps in the days of cavemen there were 20 foot spiders that ate those that travelled at night? What I do know is that the average domestic spider in the UK is unlikely to spring off the wall and eat through your skull. This set of events is not true of an undisclosed town in America were the spiders will not only drill into your brain, but they are invisible so you cannot even see them noshing your noggin. Dave and John are back. Two 20-something slackers whose only claim to fame is that they can see things that the rest of the world cannot. This includes doors that lead to the other end of town and a weapon that lets you use your imagination to kill. After a slight mishap they may have just caused more damage than they have ever averted. They have released a plague of invisible spider-like creatures that burrow into the brains of people and make them into Zombies. Whoops. 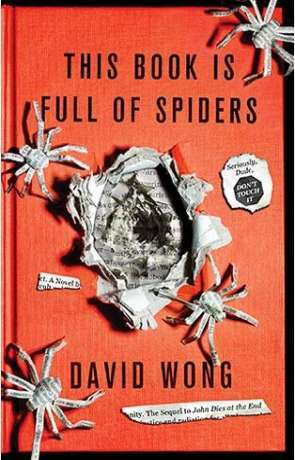 David Wong’s John Dies at the End was a slice of surreal fantasy that took you on your first trip around Undisclosed, but This Book is Full of Spiders amps up the pressure another notch. The gonzo sensibilities of the first book remain; Dave narrates directly to the reader and both he and John are actually pretty useless. The fact that you have these two blokes flapping around the place leads to some very amusing sequences. John is as likely to reach for the nearest bottle as he is to save the day. What makes Spiders such a good book is not the humour, but how this is balanced with the horror. Wong does not shy away from creating a fabulous zombie novel, which just happens to be in a fun world. When the spiders attack it is uncomfortable to read at times, the way that it should be. Like The Walking Dead, Wong also explores the horror of man. For all the flesh guzzling arachnids on the case, it is the humans that act the worst. Wong also uses time jumps to great effect. Our heroes are split on occasion and we see the story from both sides. Wong is able to use this to create some genuine surprises. There are so many great ideas packed into this book that some readers may feel a little overwhelmed, especially with a narrator who breaks the 4th wall and talks to you directly. However, if you are an adventurous reader who likes there horror fantasy action packed and filled to the gills, this is a great option. A recommended read. Written on 11th October 2018 by Sam Tyler.